Be the first to share your favorite memory, photo or story of SUSAN . This memorial page is dedicated for family, friends and future generations to celebrate the life of their loved one. 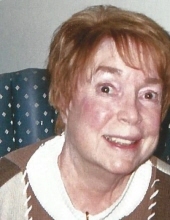 SUSAN M. McGANNON (age 79) Beloved mother of Thomas and Jennifer McGannon. Loving grandmother of Jessica, Allison, and Andrea McGannon. Dear sister of Maureen “Rini” Gauntner (Tim), F. Lambert McGannon, Jr. (deceased)(wife Janis), and Terence P. McGannon (deceased)(wife Dagmar). Aunt and great-aunt. Daughter of the late Dr. F. Lambert and Louise (nee Houck) McGannon. Passed away peacefully Wednesday, November 14, 2018. A Memorial Mass will be offered just after Christmas on FRIDAY, DECEMBER 28, 2018, at 5:30 PM, at ST. LUKE CHURCH, CLIFTON and BUNTS RD., LAKEWOOD, OH 44107. Memorial contributions may be made in Sue’s name to Eliza Jennings, 10603 Detroit Ave., Cleveland, OH 44102. Clifton Blvd at Bunts Rd. "Email Address" would like to share the life celebration of SUSAN M. McGANNON. Click on the "link" to go to share a favorite memory or leave a condolence message for the family.